Plenty of folk talk the talk when it comes to business advice and motivation. Advisors, consultants or people in high-faluting business roles may be free with their opinions but some have never actually grown an enterprise of any sort. And in his interview on my radio show this week (scroll down for the podcast) he told a lovely story of walking miles to work in the snow – which turned out to be a formative moment in his career. A door-knocking experience through Young Enterprise while at college showed Steve how much the world of business – and selling products – excited him. He got a job with an office supplies business and was rapidly promoted, turning around performance. All went well until the business was bought by a giant corporate and Steve realised their values weren’t aligned with his own. So Steve – who’d always had a desire to work for himself – and colleague, friend and now business partner Mark set up their own business – initially from the back bedroom of his parental home in 2002 – and grew it, Universal Office Products to a highly successful, multi-million turnover firm. 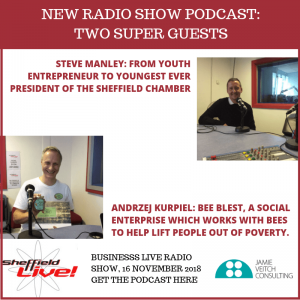 Absolutely passionate about increasing the diversity within the Sheffield Chamber further, and about supporting and encouraging young people, Steve has concrete, specific plans about how, as Sheffield Chamber of Commerce’s new President, he will do this. It was a great pleasure to interview Steve and I think you’ll enjoy the podcast. Oh, and if you’ve every wondered whether to join a Chamber of Commerce: Steve has good reasons why you should. and maintenance of beekeeping and allied projects in Sheffield, where disadvantaged and marginalised people are helped both to survive and also given a chance to thrive through working outdoors, making friends and developing new skills.